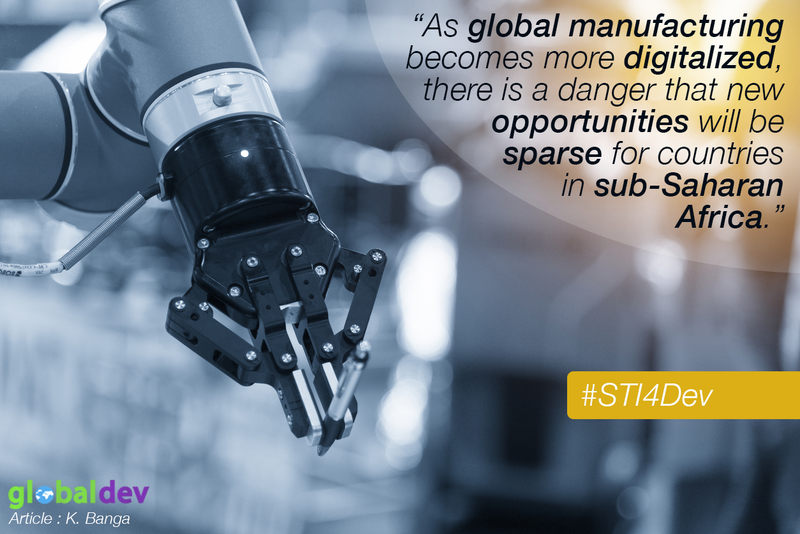 As global manufacturing becomes more digitalized, there is a danger that new opportunities will be sparse for countries in sub-Saharan Africa. The world economy is already seeing some historically labor-intensive production being ‘reshored’ to ‘smart’ factories in developed economies. This column argues that to remain competitive in an increasingly digital landscape, African countries need to adopt a two-pronged approach: boosting traditional labor-intensive exports; and investing in internet connectivity and digital technologies. In recent years, widespread optimism about technological progress and the rapid rise of digitalization has given way to growing concerns about deindustrialization in developing economies. African countries face a two-pronged problem in the digital economy: not only is the extent of digitalization lower, but the impact of digitalization on labor productivity in manufacturing is also lower. To remain competitive in an increasingly digital landscape, African countries need to adopt a two-pronged approach. This requires mounting an export push in higher value-added manufacturing as well as digital development of manufacturing, including through investment in digital technologies and targeted development of appropriate skills. During the revolution in information and communication technologies in the late twentieth century, many developing countries, barring a small group of Asian countries, saw elements of ‘premature deindustrialization’. This phrase refers to falling shares of manufacturing in output and employment in these countries much before they achieved income levels comparable to developed economies. Several factors have contributed to this trend, including globalization (which has led to an increase in imports to these countries), structural changes, changes in global demand, technological changes and, more recently, significant digital progress. Figure 1 shows that in sub-Saharan Africa, the share of manufacturing value-added in GDP rapidly fell between 2000 and 2010, recovered a little between 2010 and 2014 but has been on a declining trend since then. The digital economy is increasingly being understood as a worldwide network of economic and social activities, enabled through digital technologies. Although more than 22% of the world GDP lies in the digital economy, Africa is falling behind. While Africa’s share in the global GDP in 2015 was around 3%, its share in the total number of robots sold was more than 15 times lower (see Figure 2). And in terms of 3D printing, Kenya and Nigeria are lagging behind China, India, and the United States (see Figure 3). Several factors have contributed to this ‘digital divide’, including the higher costs of capital and internet access in African countries, higher costs of financing, lower availability of digitally relevant skills, poorer customs and logistics, and poorer infrastructure. The nominal cost of capital is falling rapidly in developed economies – at about 5-6% for robotics and 3D printing. In contrast, nominal wages in developing economies are rising. This suggests that at some point in the future, capital in developed countries, such as the United States, will become cheaper than labor in both developed and developing economies. This is likely to increase ‘reshoring’ of production from developing economies to ‘smart’ factories in developed parts of the world. Some historically labor-intensive production has already been reshored, including Philips shavers in the Netherlands and Adidas shoes in Germany. As encouraged by the Reshoring Initiative, 250,000 jobs have been reshored to the United States since 2010, and for every US company that reshores production, 126 African jobs are at risk on average. As manufacturing becomes increasingly digitalized, it is also likely that new product lines in the digital economy will remain limited to developed countries, where it is both economically and technologically feasible to carry out capital-intensive production. Production of digitally enabled smart goods, such as driverless cars, will require advances in production equipment that demand advanced infrastructure, research and development (R&D) and skilled labor at every point along the chain rather than at the extreme ends of high value-added activities. If new goods are increasingly based on a ‘digital thread’ connecting pre- and post-manufacturing tasks with manufacturing and assembly activities, then it is unlikely that manufacturing of goods in the digital economy will be shifted to developing countries, particularly African economies, with limited digitalization. While it is difficult to put a number on the ‘could have been jobs’ lost, research on Chinese manufacturing firms hints at the potential impact. Of the light-manufacturing firms in China that were surveyed, nearly a third ranked ‘technology upgrading’ as the preferred response to rising wage costs rather than investing abroad in regions where labor is cheaper. And if they did invest abroad, South Asia was chosen over Africa as the preferred destination. Labor productivity in manufacturing has typically exhibited ‘unconditional convergence’. This means that developing countries that are further away from the frontier grow faster and catch up with the developed world, irrespective of their national institutions and policies. This is in large part due to the ‘tradability’ of manufacturing goods, which allows countries to link into global production networks, facilitating technology transfer and adoption. But structural changes in the global economy – such as digitalization and reshoring – may be leading to a slowdown in trade and technology diffusion, contributing to the deceleration in the global growth of trade since 2011. This will reduce opportunities for developing economies to catch up, affecting their growth and development. Recent evidence suggests that there has already been a slowdown in convergence in sub-Saharan countries in the period from 2002 to 2013 compared with 1991 to 2002. Moreover, while a doubling of the internet penetration rate between 1991 and 2013 boosted manufacturing labor productivity in middle-income countries by 11%, the impact on labor productivity in low-income countries was eight percentage points lower. Differences in access and impact of digital technologies contribute towards the slowdown in convergence, accompanied by a lack of investment. To prepare for the digital future, African countries need to adopt a two-pronged approach. First, it is important to continue boosting traditional exports, which are more labor-intensive in nature. Here, it is crucial to move into sectors less affected by global technological change, such as paper and products, wood and wood products, basic metals and non-metallic minerals. Once African economies have built up industrial capabilities in these sectors, they can move into higher value-added manufacturing and services. But this would first require addressing the basic constraints on manufacturing, notably by improving transport infrastructure and securing reliable access to power. Second, it is important for Africa to invest in internet connectivity and digital technologies. There are already good examples of some African firms – such as Funkidz in Kenya and A-Z factory in Tanzania – investing in technology and realizing productivity effects – that is, an increase in output and exports, and the creation of more skilled jobs. This would involve creating an ecosystem for boosting digital manufacturing, targeted skills development, with a focus on Science, Technology, Engineering and Mathematics (STEM) and Technical and Vocational Education and Training (TVET); effective public-private partnerships in digital development and educational curricula; and technology and innovation hubs (such as the iHub in Kenya or the Kumasi Hive in Ghana) that are well embedded in the domestic economy. Karishma Banga is a Senior Research Officer at the Overseas Development Institute in the International Economic Development Group. Under the Supporting Economic Transformation programme, Karishma’s work focuses on the digital economy and the future of the manufacturing-led development model.